Buy through MusicWeb for £14.60 postage paid. This is the second volume and completes the set of seven psalms. The Psalms are considered to be amongst Lassus�s finest church music, and that is saying something as he was one of the most prolific composers that has ever lived. But to understand the music and indeed the performance we need to look back into the antecedents of these psalm settings. In 1566 Lassus was persuaded to join the court of Duke Albert V of Bavaria at Munich where he was to spend the rest of his life. These psalms were composed about 1560 at the request of the Duke who was so moved by their depth of emotion that he had them specially copied on to parchment, illustrated with miniatures by the court painter and bound in two volumes in red morocco with silver clasps. Lassus, according to Marc R. Vogelsang the writer of the detailed and fascinating booklet notes, would apparently have preferred that the music was published. His wish did not come to fruition until 1838 and ever since these psalms have been regarded as among the masterpieces of renaissance music. A contemporary of Lassus, Samuel Quickelberg said of them: "One does not know whether the sweetness of the emotions more adorns the plaintive melodies or the melodies the emotions". Lassus does not set these psalms as continuous music but varies the numbers of voices per verse according to the text. Capriccio has indexed each verse which on most but not all CD players will enable fairly easy access. Psalm 51 which opens the CD for example has twenty-two index points. All of the psalms are scored for five part choir with divided tenors. The wonderful word-painting was considered to be quite a novelty and still comes across as particularly fresh and imaginative. The fifth penitential psalm, a setting of Psalm 101 or 102 in the Vulgate, is the longest of all and is worth a closer examination. It opens with a full-blooded cry of the sinner to God. Having gained His attention he sadly confesses his affliction in verse four set for low voices. At the words "consumed like smoke" the music vanishes abruptly for a moment, the same thing happening in verse twenty-seven after the word "perish". There is more. In verse eight we hear, in the two discantus parts, the sparrow flying, then settling, solitary and still on the rooftop. In verse ten the sinner�s weeping is portrayed in dolorous downward falling figures. In verse twenty, when the Lord in Heaven looks down to earth, the top line drops a whole octave. In verse nine Lassus marvelously conveys the insidious chattering of the enemies in just two top voice parts. Now let us consider the performance. Some of you may know some woodcuts of Lassus at work. One shows him at the keyboard with instrumentalists of the Bavarian court. There is also an illustration by Nikolaus Solis of the Wedding Banquet in the George-Saal in Munich on 22nd February 1568.In the foreground Lassus is seen surrounded by members of the �Kapelle�. It is interesting to notice that there are young men and obviously a handful of boys. There is also an organ, some sackbuts, a bass viol or two and possibly more strings. In other words it seems that Lassus is just about to present his music (he carries a book) with singers and instrumentalists. I have seen other similar illustrations: one by Hans Mielich which also shows singers and a multifarious group of strings and wind (New Grove). It is this exact sound-world which is here recreated by Gerhard Schmidt-Gaden on this amazing recording. b) Boys are used instead of men on the top line and/or the alto line as a higher pitch is generally used especially in the fifth and seventh psalms. In the other two psalms the male altos are used as a lower pitch is required for these somewhat more solemn settings. 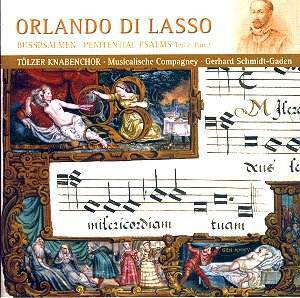 The instrumental participation seems to allow Lassus�s textures to be more clearly marked. Sometimes the instruments are left alone for a wonderful moment. Like the composers of the earlier Josquin generation, Lassus used much imitation and canon. He also sometimes utilizes strong homophonic textures. The lower lines are solemnly declared by low brass against a single alto or treble voice. I have to say that the tuning of these very continental sounding boys is not always up to scratch, as they seem to be aiming up the notes from a chest voice instead of, what we expect from the Oxbridge sound: the ringing head voice. The other soloists are acceptable but not especially exciting in vocal quality. The tempi can be unvarying and I am not always keen on the balance in the sections between instruments and soloists. The boys especially seem to be positioned behind the sackbuts at one point which I can�t think is a good idea. Nevertheless, although these are not perfect performances (is anything?) they are by far the best and most arrestingly authentic I have yet heard. They attract my attention not through the quality of singing necessarily but through the clear direction and imaginative colouring of lines and textures. The more I hear them the more I like them and, what�s more, I admire the music even more.